I had read somewhere all of us have writers hidden inside with some beautiful stories to share. It is just a matter of picking up a pen to jot it down. 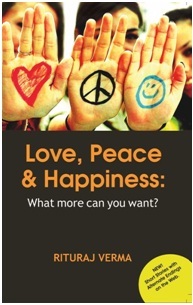 ‘Love, peace and happiness’ by Rituraj Verma is an innovative concept by the author somewhat based on these lines. This book has 9 stories revolving around the urban life where the author talks about love, friendship, relationships, marriage, intimacy, trust and other such issues which we face day in and out. He has added a unique touch to this book by giving alternate endings to each story in case you don’t like the ones in the book. He has shared them on his website HERE and still if you are not convinced you even have a chance of writing your own. It is like giving a mike to each one of us and asking us to speak our hearts out. Hoping to change the world, one story at a time. Firstly I would like to applaud the author Rituraj Verma for coming up with such a brilliant concept which makes each and every reader feel like a part of the story. As you read each of these nine stories you are intrigued to keep your thinking cap on just in case you don’t like the ending how would you want it to end. Personally I find human relationships very complex. We love someone, we love someone else too result is confusion. We cannot decide whether we should continue is a relationship or not. We fall in love; we fall out of love not knowing what we want. We care for some because we want to be cared for in return but what happens is we keep on caring without anything in return and are left out feeling all used. All this sounds so complex. But you noticed one common emotion amidst all this? Love. Yes at the end of the day we all are love-hungry souls and each and every act of ours is somehow related to that one thing called love! These nine stories revolve around such love-hungry souls whose life keeps on getting more and more complex with their never ending search for it. These stories touch your heart very deeply. I was not able to keep it down once I began reading as it kept on getting better and better with each page. I remember crying my heart out at 2 am in the night after I had completed reading it simply because I could see a glimpse of Me there hidden somewhere in those pages. The author has also claimed that each one of us who reads this book will find atleast one person whom we know in those characters...how true he was!! Lucid language depicting true human emotions is what makes this book a worthwhile read. My personal favourite would be The victim of many loves and The pursuit of perfection and no prizes for guessing the reason for it! Though there are a few typos combined with some spelling and grammatical errors spoiling the joy ride. Nevertheless this book gave me an experience which will be cherished for a long time. As very few authors are able to narrate both pain and joy so eloquently. A must read for people who like Indian fiction liberally doused with emotions of friendship, romance and intimacy. This book is like bhaang! As I was feeling high emotionally after reading it. My senses were numb for quite a while as tears refused to stop flowing from my eyes! It seems you felt quite a attachment with this book (as your tears refused to stop at 2 am also), interesting. Does this short stories are complete in itself ? Usually sometimes while writing short stories lot of expressions and thoughts do not emerges out. 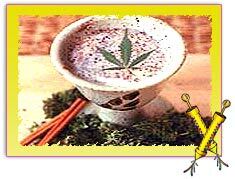 I have had as prasad on shivratri but not the intoxicating one. I have heard it kind of gives you a high making you do weird things. Yes..I got attached to this book very much! The stories are complete in their own manner and yet there are alternative endings suggested on the website for you to read incase you are not convinced with the one given in this book. I would say it is all a matter of perspective. I might love something while you would not be even able to bear its sight so I cannot comment whether the thoughts emerge here. As for me, this book talked to me specially when I needed it the most.